Hi all! Hope you had a lovely weekend. It's still unseasonably warm here in Atlanta - a double edge sword, so to speak. On one hand you can't help but enjoy the warmer days and nights and on the other, it's not very winterish. How's a girl to curl up with her favorite book and a warm cup of tea when it's a balmy 65? The collage above shows a sampling of new things going into the shop this evening at 8:00. I'm mesmerized by the uniqueness and versatility of small zippered bags. 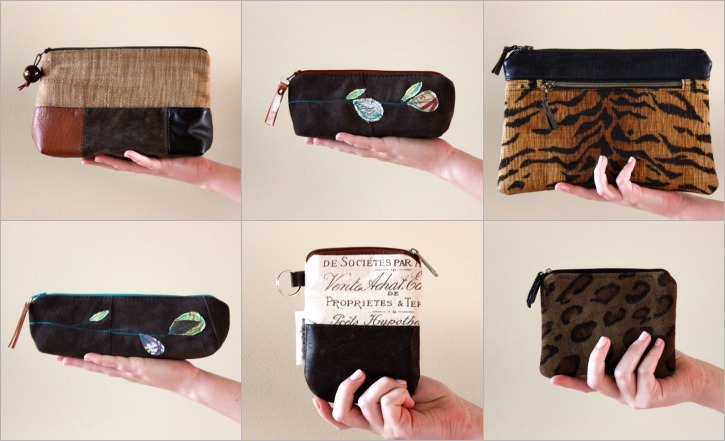 I'll have several large, small, and tall artist's pouches, key pouches, and adorable zippered leather pouches. I love each and every one. Maybe it'll cool off and I can edit whilst curled up in front of a warm fire with a nice cup of tea...a girl can dream. Each one is so different yet lovely. I can see you have enjoyed making these. Yum! I like the bottom middle one the best. fun, fun. i hope you get your cup of tea!